“Rich Coast” is what Costa Rica means in Spanish and the name given by early explorers looking for gold. As it turns out, Costa Rica was not rich in gold but rich in many other ways. She is a tropical country located in Central America. Having borders on both the Pacific Ocean and the Caribbean Sea, her neighbors are Nicaragua to the north and Panama to the south. Costa Rica gained independence from Spain in 1821 as part of the Mexican Empire. The majority of the population is mestizo, a mix of European, mainly Spanish and other descents. The balance are native Indians, indigenous to the area. 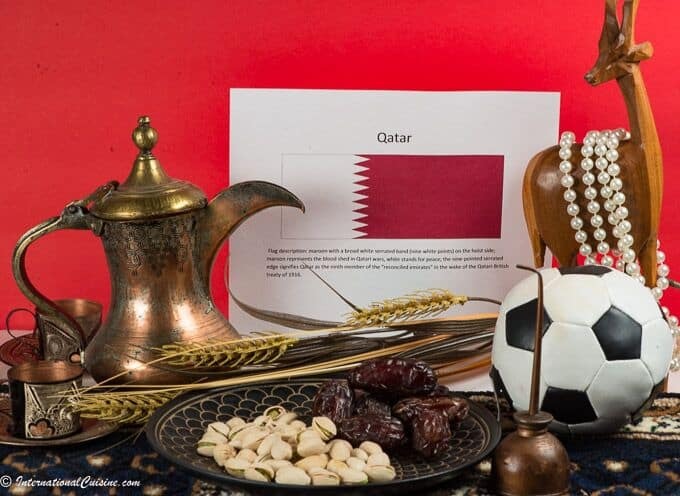 Spanish is the official language, although English is commonly spoken. Roman Catholic is the official religion with many others practiced as well, as they endorse an open tolerance policy in the country. Costa Rica abolished their military in 1949, after a brief civil war, becoming the first, of only a few sovereign nations, without a standing army. “My country is your country”, was the first thing our taxi driver said to us upon our arrival. We flew into the capital city of San Jose for a fishing expedition on the Caribbean side. The people of Costa Rica are called Ticos or Ticas, depending upon their gender. While we waited for our plane we enjoyed some bocas (appetizers) and a cerveza (Imperial, the local brew.) We then boarded a small prop plane and flew to our lodge, located in the jungle near the small village of Barra del Parismina. This is where our adventure would begin. The lodge was nestled amongst every type of palm variety imaginable. Bougainvillea’s, hibiscus and orchids (their national flower) in all the colors of the rainbow, abounded. The sound of the jungle was amazing; birds chirping and humming, cicadas singing us their welcoming tune. This small country, at only 20,000 square miles, has five percent of the world’s bio-diversity; the most, based on size, of any other country in the world. Howler monkeys were our five a.m. wakeup call to start off our day. Soon a potful of aromatic (and robust) Costa Rican coffee was delivered to our door. Coffee is a major export of Costa Rica and there are many different, gourmet brews of coffee produced there. From the mid 19th century, decorated ox carts called “carretas”, were used to haul the coffee beans from the central valley over the mountains to the Pacific coast. This journey would take 10 to 15 days. The carreta was ornately decorated as a matter of regional pride. Each cart would create a unique song, produced from the metal ring hitting the wheel’s hubnut, as it bounced along the muddy trails. The decorated carreta, although a fading art form today, is considered Costa Rica’s national symbol. We came to Costa Rica for the fishing, known to be a phenomenal exploration. On our first outing, we glided down the jungle rivers and then headed out into the Caribbean Sea. We fished for snook and tarpon, however the waters were ripe with bull sharks. Our guide’s keen navigational skills, while heading in and out through the mouth of the river to the Caribbean, were duly noted. He told us stories along the way of the many fatalities befalling those that did not respect just how treacherous the river can be. This certainly added an interesting level of excitement to our adventure which was well worth it, we caught behemoth tarpon, many snook and some very interesting river fish. The sun rises and sets at the same time in Costa Rica, 365 days a year, due to its proximity to the equator. The lodge provided these beautifully crafted rocking chairs, made locally, of wood and leather that were set out on the veranda for enjoying the sunset. (We loved them so much we had to ship a couple home.) After fishing, we relaxed on the veranda and shared stories with the other guests. All at once, an awesome thunderstorm developed and ripped across the grounds. The staff seemed to take this in stride, as trade winds and heavy rainfall are common on the Caribbean side of the country. In fact, the mountains receive almost 200 inches of rain per year. On our last night at the lodge, we feasted on grilled snook, that we had caught that day while surf casting. The snook was served with their famous black beans and rice, along with a delightful hearts of palm salad. Our meal was superb. The trip so far, was everything we imagined it to be and more. We had such an incredible time, we decided to change our plans and extend our stay. To complete the journey, we wanted to fish and explore the Pacific side of Costa Rica. The lodge graciously made our arrangements to stay at a beautiful resort and for the prop plane that would take us there. The plane ride over the country was something to behold. There is always a unique perspective gained while seeing a country from the air. The land is so lush and breathtakingly beautiful. Flying over the middle of the country we saw many volcanoes, some of which are still active, producing earthquakes in the regions. We also noticed plantations of bananas, coffee and sugarcane. (Costa Rica is the second largest exporter of bananas after Ecuador.) Each of the villages had a cleared, green patch for soccer, or futbol, as it is called in Spanish. It is their national sport. Of course, the cities have many soccer fields as well and we were told that even if you are not watching the game, you know if the national team has scored based on the honking of horns and shouts heard in the streets. The plane landed on a dirt strip, no airport or building or anything of the sort was there. The pilot unloaded our luggage and said someone would come to pick us up. We wandered around a bit, and then sat on our luggage for a good 45 minutes, as we started to get a little concerned. We could see a small road in the distance and decided to head that way and see if we could find a phone somewhere. We came upon a very small village of about a dozen houses. Chickens and pigs lined the roads looking for grub and happy children played among them. Thankfully we found someone who informed us, that the only phone in town was at the blue house down the road. Just about the time we arrived at the blue house, a jeep came honking its horn looking for us. It was our ride to the resort. After about a 45 minute jeep ride through the verdant jungle on dirt roads, we arrived at the most beautiful resort, located right on the shore of the Pacific Ocean. Our room was not quite ready, so we enjoyed a lunch of arroz con pollo (chicken and rice) with potato chips. This dish is commonly served throughout the country. It is full of all sorts of vegetables as well, so it’s a well-rounded dish that is sometimes served with French fries instead of potato chips. On the tables everywhere in Costa Rica you will find a bottle of Linzano salsa. It is interesting salsa and not easy to describe. It’s not spicy but has a unique flavor that grows on you and you find yourself putting it on everything and missing it dearly when you return home. It is not easily found outside of Costa Rica, so be sure to stock up while you are there! During lunch, my husband inquired about a fishing boat for the next day. Much to our dismay, we learned there was a fishing tournament going on and there were no boats to be found locally. They told us there is one small, 18 foot, Boston Whaler, located in a town called Tamarindo, about a three hour cab ride away. I would have been more than happy to chill at this beautiful oasis for a few days, but that was not to be. Off we went in the cab to Tamarindo. The hotel was small and nothing like the resort we left behind, but it would do. We planned to explore the town in the afternoon and my husband would be able to fish in the Pacific the next day. There are many expats living in Costa Rica from the United States and elsewhere. We met several while we were out exploring and it is easy to see their attraction to this place. The country is stunningly beautiful and the people are so friendly. Everywhere we went, we encountered a greeting. They would say “Pura Vida”, meaning “pure life”, a way to express how they felt about this country. My husband left early the next morning for his fishing expedition and the boat picked him up right on the beach in front of our hotel. He could write a book just on the fishing trip that day, but suffice it to say in just three short hours he hooked up 26 and caught 13 billfish: mostly sailfish but some marlin, with double, triple and even quadruple hook ups. Of course he didn’t get them all to the boat. (It is the ones that get away that make the best fishing stories.) Costa Rica has a catch and release policy to ensure that sport fishing remains one of its best tourist attractions. It was one of his best fishing days ever; a memory for a lifetime! Tourism has taken over as the number one source of economic wealth for Costa Rica. It is easy to see why. Eco-tourism was pioneered there, with many ways to experience the flourishing, tropical country, ripe with adventure and wonderful, welcoming people. What’s not to love? We headed back to the capital city of San Jose and we ended our trip with lunch at a local restaurant. We ordered a popular meal called “casado”, which means “marriage” in Spanish. The meal was served on a banana leaf. It was rice, black beans, roast pork, a salad of cabbage, tomatoes and onions, with a light citrus dressing and a fried plantain. The cuisine in Costa Rica is well balanced and hearty. It is not spicy, as one might think, but very tasty. Rice and beans are part of every meal. For breakfast, the rice and beans are mixed together in a dish called “gallo pinto” or “spotted rooster.” Often the dish is made with leftovers from the night before and served with eggs, fresh cheese and a fried plantain. Fresh fruits and vegetables are found everywhere, as well as freshly baked pastries to enjoy with your coffee. You will also see the locals with a machete whacking off the top of a green coconut and inserting a straw into it for a refreshing drink. 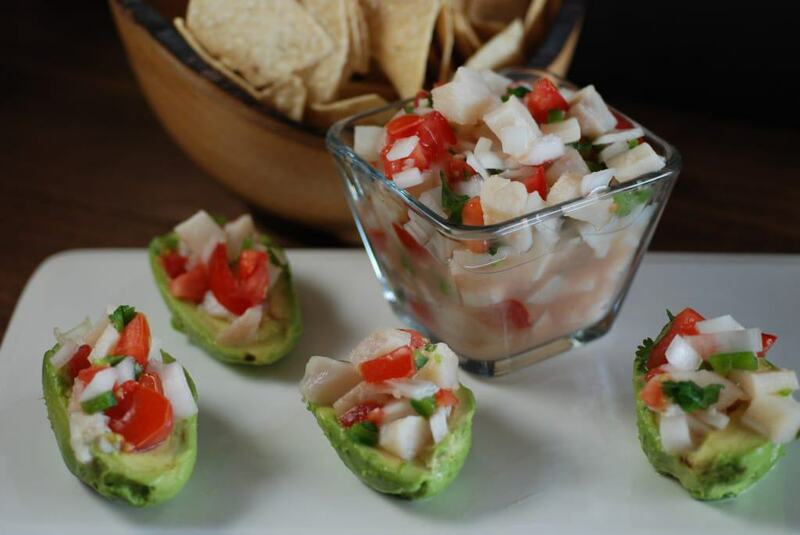 Ceviche is another one of the country’s most popular dishes, usually made with fresh sea bass or tilapia. On both coasts you will find a wide variety of seafood, such as calamari, crab and lobster. Seafood is sometimes substituted for pork or chicken in casado. 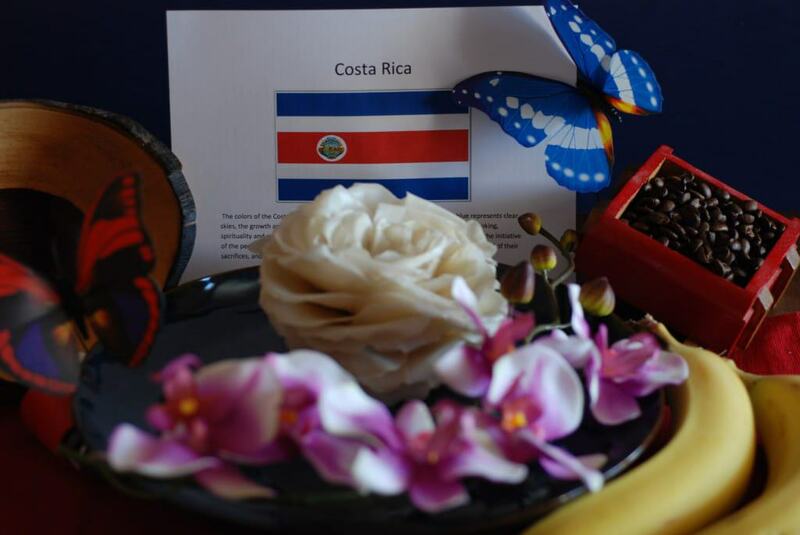 We set the table using the colors of the Costa Rican flag, which are red white and blue. 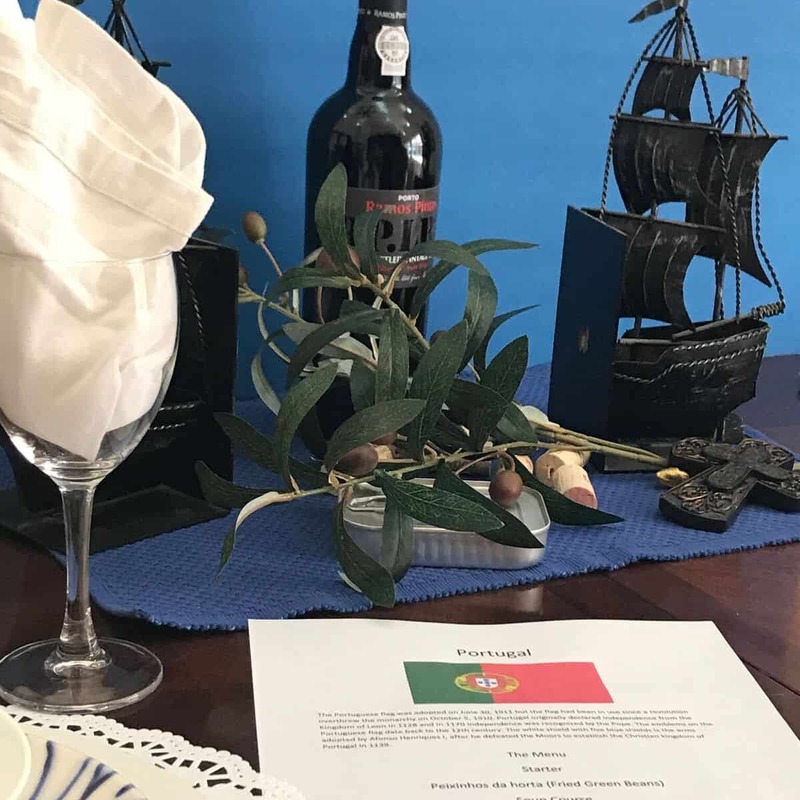 We had a few souvenirs from our trip, which we added to our table as well. One decoration was a rose made from tarpon scales and another, a beautiful, hand crafted wooden bowl and of course coffee beans. In Costa Rica, time is known as Tico time, or “la hora tica”, as Costa Ricans are habitually late by about 30 minutes. This is customary and never considered rude. It sets the tone for their easy-going ways. We began the meal with a delicious ceviche, made with fresh tilapia and served in avocado bowls. It was scrumptious. They use a secret ingredient in their ceviche, ginger-ale, for just the right balance of sweet and sour. An Imperal cerveza was the perfect complement. Next, we had a black bean soup, called sopa negra. 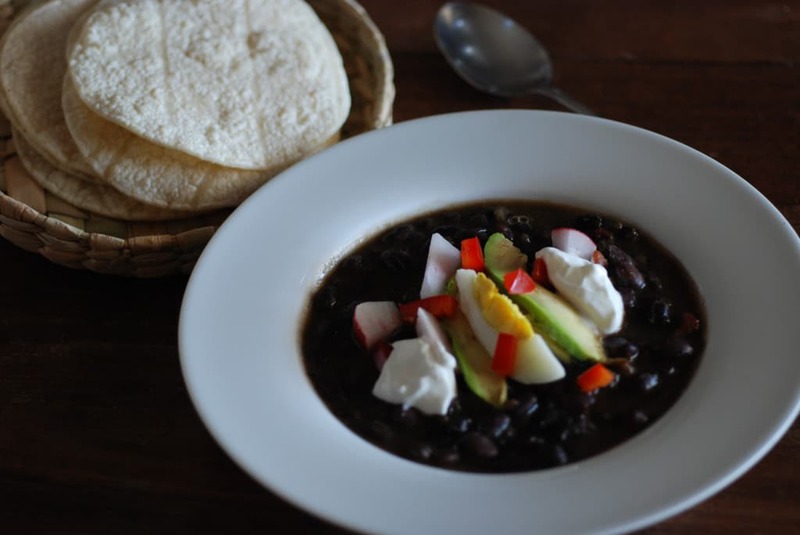 The garnishes of sour cream, avocado, radish and hard-boiled egg, made this soup exceptional. 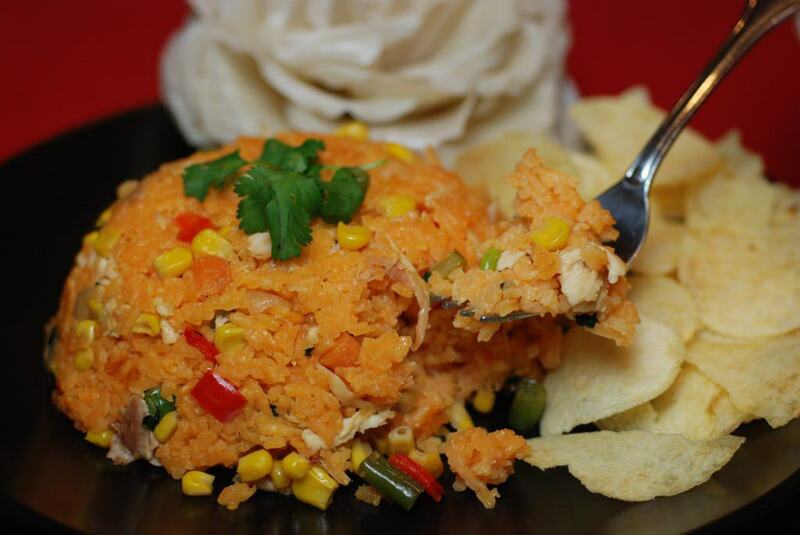 The main course, arroz con pollo, was prepared in the manner it came to us in Costa Rica, with potato chips, mixed in for a little added crunch. 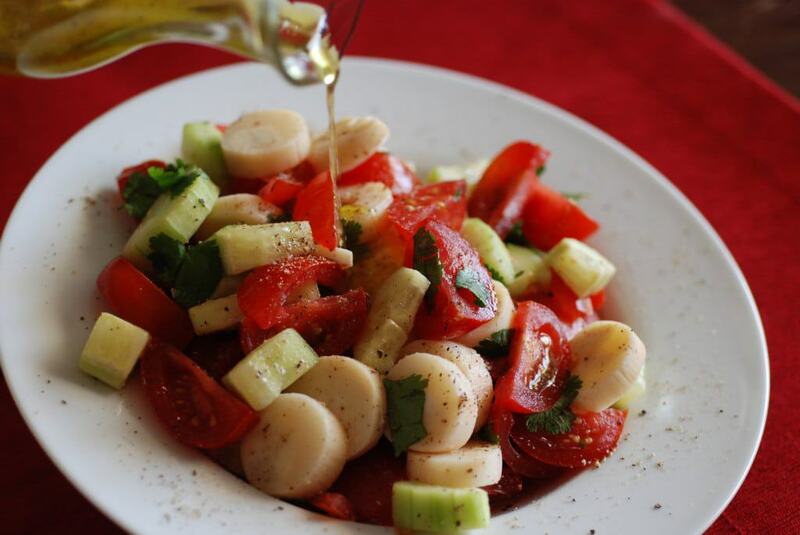 We accompanied it with an outstanding, hearts of palm, salad. For dessert, we chose the national dessert, called tres leches. 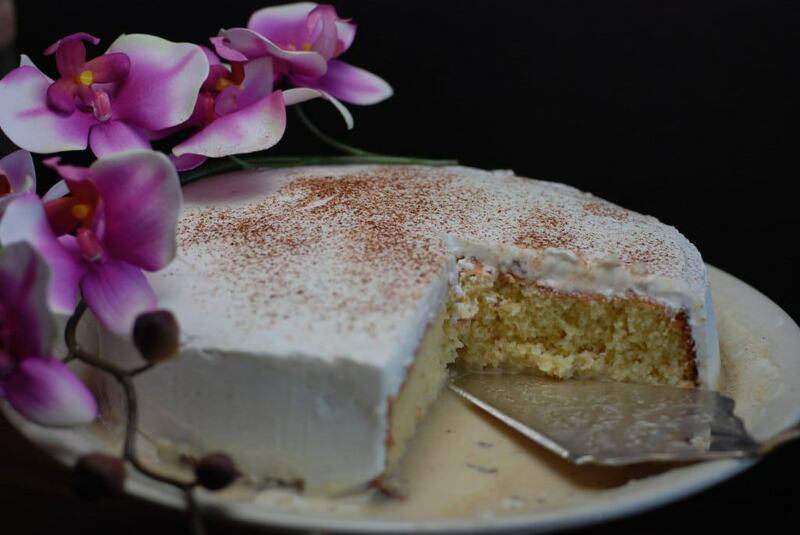 It is a delicious cake that is served wet, as it is made with three types of milk and covered with whipped cream. A hot cup of Costa Rican coffee added a soothing warmth as we reminisced about our fantastic trip to this beautiful, tropical paradise, called Costa Rica. We sat back in our rocking chairs and toasted to “Pura Vida.” Muchas gracias Costa Rica! You are amazing in your writing and photo’s. what a cook you have become! wow! !